I wake about 7am and decide to stay another night in the Alberque; it's only 2 miles from the Cathedral and I don't have to worry about my pack. 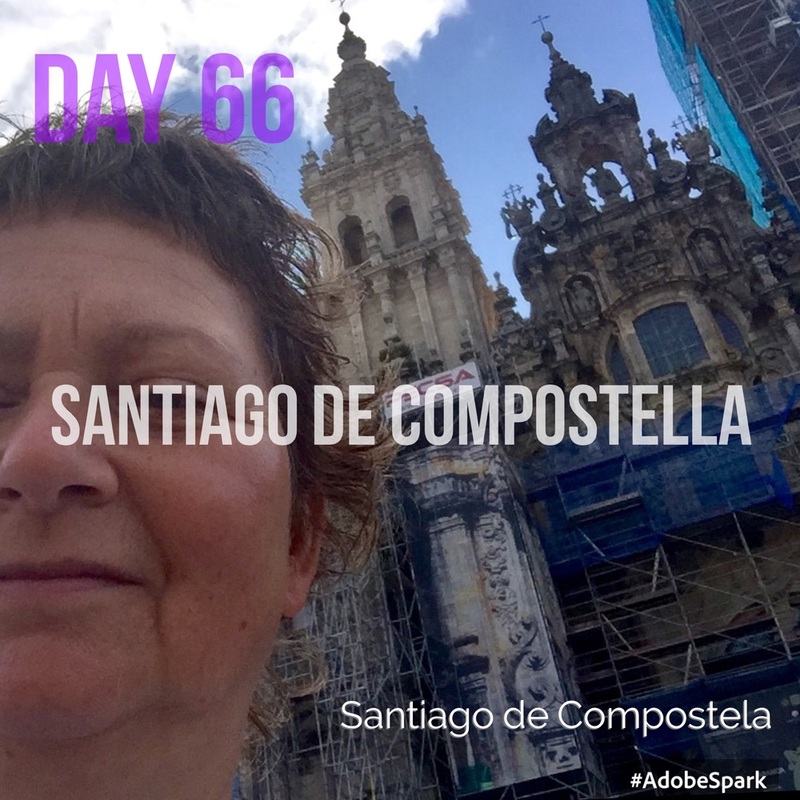 Santiago is a large modern city and I walk into town through the usual suburbs and highway engineering, but the bustle of traffic ceases at the Porto Santiago as I enter the Old Town. Concrete and tarmac remember granite and terracotta. Old palaces, churches, monasteries and arcaded streets begin to appear. 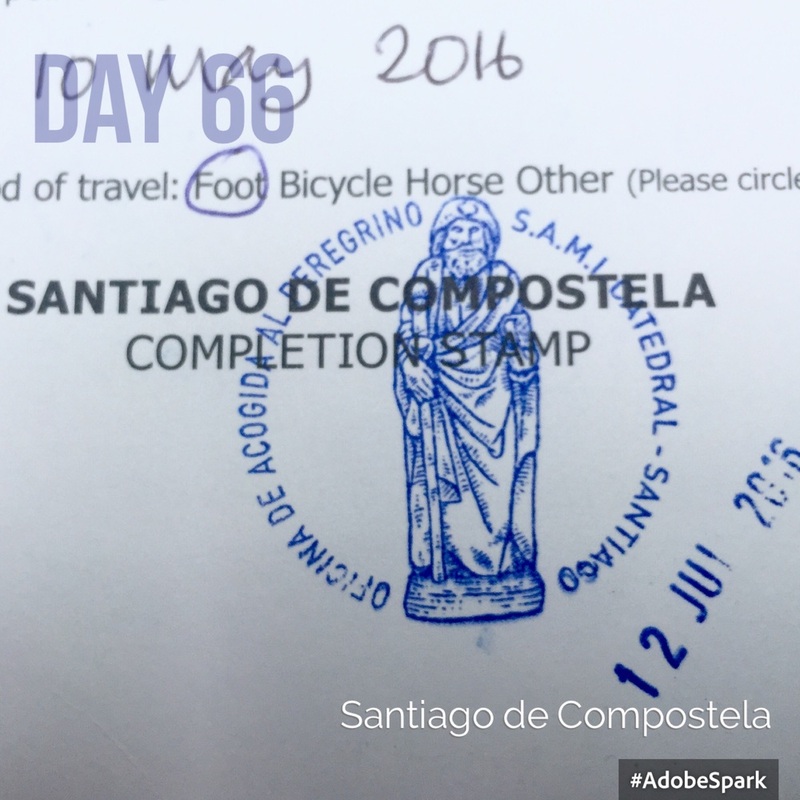 The "Compostella" is the official stamp to say I've completed my pilgrimage to Santiago. 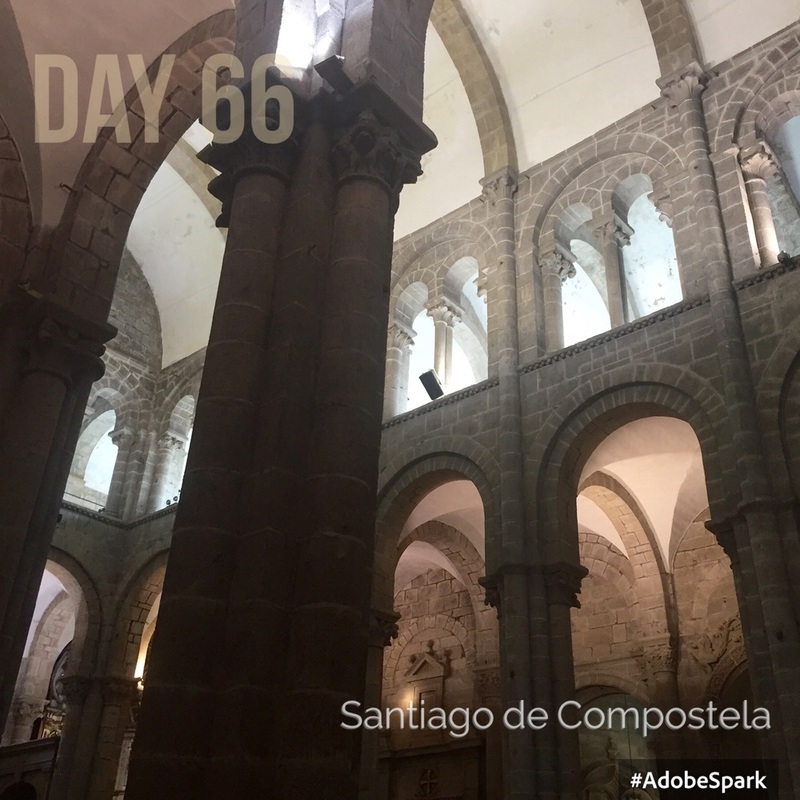 There are a few early-bird pilgrims in the Cathedral square, but no queues at the Pilgrim Centre, where I have my Credencial stamped with the "Compostela"; the official sello that confirms I've completed my pilgrimage to Santiago. The man behind the desk shakes my hand and I feel he understands what it means to have made this epic journey; I sit in the courtyard to appreciate what I've achieved and the support team of hospiterlos, waiters, cooks, pilgrims and the many kind Spaniards that have made it possible. My certificate says I've walked 805km (498miles) but I'm rounding it up to 500 miles to cover all those detours I made... it's probably a lot more. Next I head for the Cathedral. It's smaller than I imagined; Romanesque with Baroque additions. The facade is under scaffolding and I can hear the reassuring tapping of masons' chisels on granite. The chancel is a riot of silver and gold with huge pink cherubs supporting a golden canopy over the statue of St James; all reminiscent of a magnificent fairground carousel. Glorious. St James in his silver shrine is hugged by thousands of pilgrims! The giant silver incense burner (botofumerio) is in the foreground. I visit the shrine of St James and as invited, embrace the ornate silver cover on his shoulders and thank him for the journey. The words that come to mind are 'fear not' which is different to 'be brave' and then 'endeavour', which is both a verb and noun. Early 15C., "pains taken to attain an object," literally "in duty," from phrase put (oneself) in dever "make it one's duty" (a partial translation of Old French mettre ...from Old French dever "duty," from Latin debere "to owe" (see debt.) One's endeavors meaning one's "utmost effort" is from late 15c." The incense was originally to cleanse the air on the arrival of thousands of smelly mediaeval pilgrims. There are bagpipes playing in an arch beside the Cathedral; they bring tears. Their plaintive flow are embedded in the heritage of this part of Spain and remind me of the majestic and rugged beauty I have experienced. This journey has taught me about embodiment and encounter; my body and its relationship with the ground under my feet and the beauty and decay before my eyes. Everyday I have encountered Place; it's people, culture, scenery, flora and fauna. 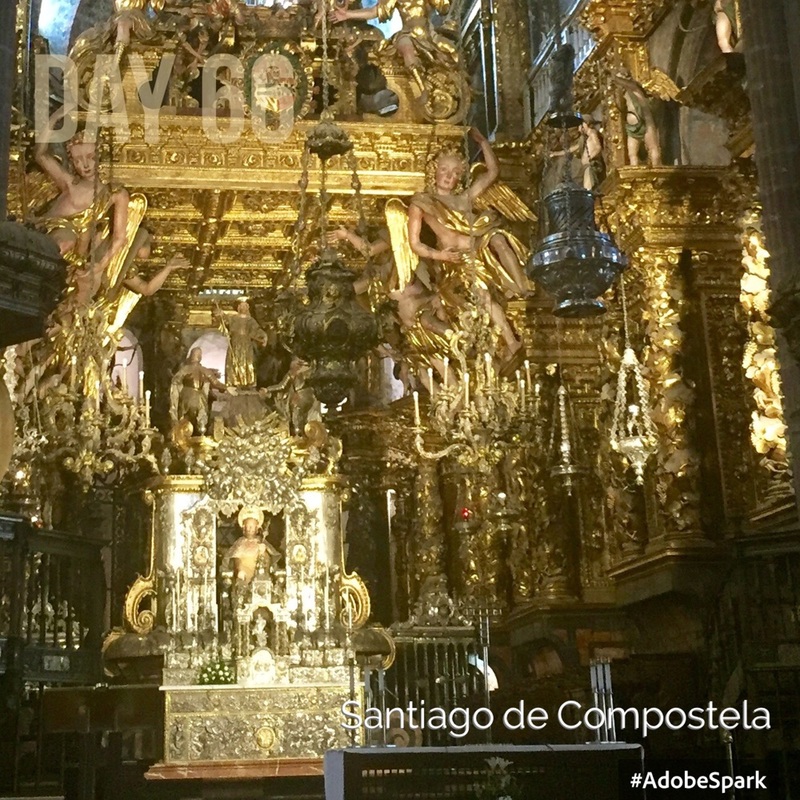 Santiago is full of souvenir shops selling everything a pilgrim or tourist could desire... staffs to lean on, gourds to drink from and shells to wear on your pack. Then there's thousands of silver bells, statues of St James, tee-shirts and painted plates. But what will I take home I wonder? I spend most of the day quietly sitting in bars writing and sorting photos. Coffee and cake, a Menu del Dia lunch of delicious lentil stew followed by a mixed salad. Then a visit to the Cathedral Museum, sadly all the text was in Spanish but still amazing. The granite carvings were once covered with gesso and painted so the cathedral must have been covered with colourful stories. A painted granite carving in a church near the Cathedral. I attend the Pilgrim Mass at 7.30pm. It's all in Spanish of course, I wish I could have understood the homily. All the way through I could see arms protruding out of the shrine to hug St James; he has given us a wonderful journey. Then the 2 mile walk home and bed. A wonderful day.